Last Friday Mom loaded the kids into the car and met me for lunch. I picked up some sandwiches and we ate at the park. The weather was perfect; warm in the sun with a constant cool breeze. Alyce ate her lunch of pb&j rather quickly because she wanted to play on the slide, and the only way we would let her was if she finished lunch. She was in such a hurry when she finished we asked if she wanted to play on the slide or have a cookie and she responded with "Slide". Either the cookies aren't that good or the slide was that important. Alyce's agility is increasing. 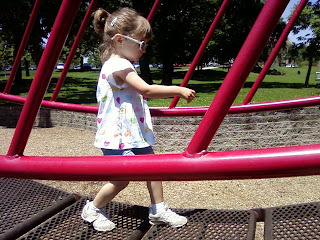 Every time she has access to a playground she is more able to do things by herself. Her being more able doesn't mean that I am less vigilant. Whenever Alyce walks past an opening on a high piece of playground equipment my heart races a bit. This time at the playground Alyce did two things that impressed me. The first was that she found a football, picked it up, carried up to top of the slide, and let it roll back down. 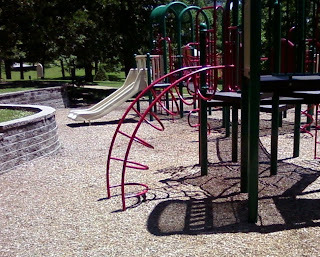 She enjoyed its irregular shape and odd bounces as it traveled down the slide. The second item was Alyce's trip up the jungle gym bars. These bars transition from a climbing experience to a walking one where feet and arm placement is important. She climbed up the first vertical part without any problem and managed the second horizontal well little trouble. I held onto her the entire time with my hands supporting her around her chest. When Alyce was on the flat section I could feel her heart pumping in her chest and her breath quicken as she moved each foot from pole to pole. She must have been under a lot of stress but didn't complain or want to go back down. 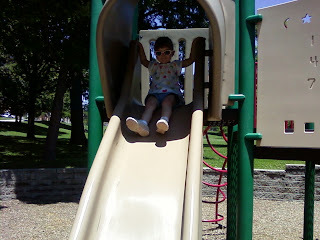 When it was all over and she was on top of the slide she beaming with pride with Mom and I beaming as well. 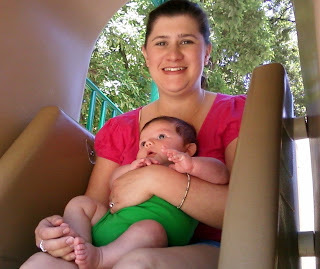 Other items of note during this trip to the park was that Luke got to go on his first trip down a slide. He had assistance from mom and didn't really have an opinion on the whole experience. 0 comments on "Perfect Friday At The Park"